For other people named William Henderson, see William Henderson (disambiguation). William Henderson and sailors watch Super Bowl XXXIX in the galley of USS Russell. William Terrelle Henderson (born February 19, 1971) is a former American Football fullback who played twelve seasons for the Green Bay Packers of the National Football League (NFL)., whom he won Super Bowl XXXI with against the New England Patriots. He played college football for the University of North Carolina at Chapel Hill, and was chosen by the Packers with in the third round of the 1995 NFL Draft. Henderson attended Thomas Dale High School in Chester, Virginia. He played varsity football as a freshman, sophomore, and junior, but sat out his senior year due to a knee injury. At the University of North Carolina at Chapel Hill, Henderson finished his career with 145 carries for 750 yards (5.17 yards per carry avg.) and 14 receptions for 97 yards (6.93 yards per rec. avg.). 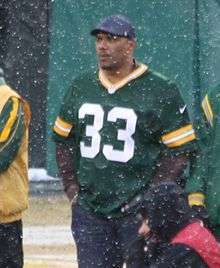 Henderson was drafted by the Green Bay Packers in 1995, and has played every season in his career with the Packers. He came into the league as number 30, but after cornerback Doug Evans left, changed his number to 33. Henderson was durable and effective for the Packers, solidifying the team at fullback after moving into the starting role in 1996. Nine times in his first 11 seasons he played in all 16 games. He was selected to 2004 Pro Bowl. His consistent play, especially in his later years, had many Packer players and fans calling him "Old Reliable." Henderson blocked for six of the top nine individual rushing efforts in team annals — Dorsey Levens' 1,435 yards in 1997 (third), Ahman Green's 1,883 in 2003 (first), 1,387 in 2001 (fourth), 1,240 in 2002 (sixth), 1,175 in 2000 (seventh) and 1,163 in 2004 (ninth). Henderson was also valuable as pass catcher out of the backfield. As of 2008, he stands tenth all-time on the Packers' career receptions list with 320 (for 2,409 yards), and first among running backs. He also has 123 career rushing attempts for 426 yards. On March 7, 2007, the Packers released Henderson amidst rumors that the Packers were trying to sign star fullback Justin Griffith. GM Ted Thompson released the following statement. "We are releasing William at this point so he can pursue other opportunities within the National Football League," GM Ted Thompson said. "The Packers organization is extremely appreciative of his efforts over the past 12 seasons. His leadership and work ethic set an excellent example for everyone in our locker room. It is difficult to part with a high-character individual like William. He has been an influential person on several outstanding Packers teams over his career. He always will be considered a Packer." Henderson has eight years (1999–2006) of broadcasting experience as co-host of Monday Night Kickoff, a show produced by Green Bay TV station WBAY. He also worked as an analyst as part of ESPN's NFL Draft coverage April 2006. He is married to Brigitta Henderson, and has two children, William II and Jayden. Henderson splits residence between Green Bay and Richmond, Virginia. Henderson was selected as Green Bay's 2001 'Unsung Hero,' in recognition of his efforts both on the field and in the community. Wikimedia Commons has media related to William Henderson (American football). 1 2 3 "William Henderson Stats". ESPN Internet Ventures. Retrieved 18 March 2014.